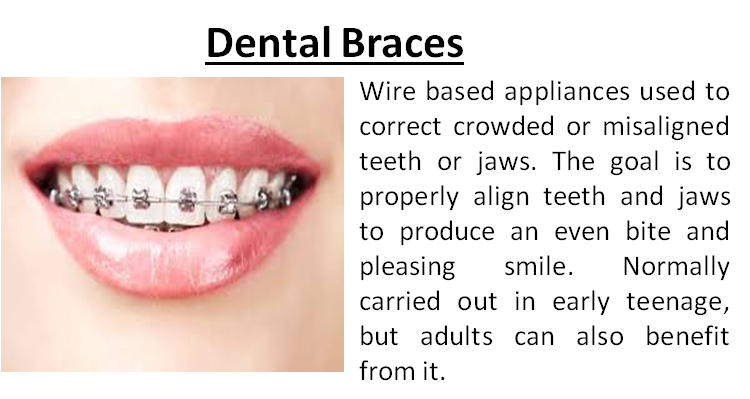 Dental braces are wire-based appliances that orthodontists use to correct crowded and misaligned teeth or jaws. Many people who need dental braces get them during their early teenage years, but adults also can benefit from wearing braces. The goal of dental braces is to properly align your teeth and jaws to produce an even bite and pleasing smile. For minor corrections, another option is a series of customized, removable appliances called clear aligners or "invisible braces." They may be more expensive than fixed braces, but may have a more acceptable appearance to some adults. Clear aligners may take longer to move teeth, but are still effective with regular use. However, many people need fixed braces to properly correct their dental problems. Modern materials and technologies make the experience of having dental braces much more comfortable than in the past. Proper alignment of your teeth and jaws may improve not only the appearance of your teeth but also the health of your mouth and the way you bite, chew and speak. If you're an adult with braces, you may need to wear them longer than a younger person would, but they can still produce similar results — for example, to correct crooked teeth or a misaligned jaw. Because your facial bones are no longer growing, however, there may be some problems that can't be corrected with braces alone. Wearing dental braces is generally a very safe procedure. However, there are some risks. · Shorter root lengths. During tooth movement, some of the bone in the path of the moving tooth dissolves, while new bone is laid behind it. Permanent loss of tooth root length may occur during this process, which could lead to less stable teeth. In most cases, however, this doesn't cause any problems. · Loss of correction. If you don't follow your orthodontist's instructions carefully after your braces are removed, particularly when it comes to wearing a device called a retainer, you may lose some of the correction gained while wearing your braces. · Cut down on sugary and starchy foods, which substantially contribute to plaque formation and tooth decay. · Brush carefully, preferably after every meal, with fluoride toothpaste and a soft-bristled brush. If you can't brush your teeth after your meal, rinse your mouth out with water. · Rinse thoroughly to get all particles out of your braces. Check in the mirror to make sure your teeth are clean. · Use a fluoride rinse if recommended by your dentist or orthodontist. · Floss between braces and under wires with the help of a floss threader. Your orthodontist also may recommend a small flexible toothbrush to clean between braces and wires. · Avoid sticky foods — such as chewing gum, chewy candies, caramel and taffy — that can pull off brackets, bands and wires. · Avoid hard foods — such as ice, hard candies, popcorn and nuts — that can break parts of your braces. · Visit your dentist for checkups and cleaning as often as your dentist recommends, to keep your teeth and gums healthy. · Follow instructions — lack of compliance can extend the time needed for completion and increase the chance of complications. If your regular dentist notices problems with your teeth or jaws that may require treatment, he or she will likely refer you to an orthodontist — a dentist who specializes in diagnosing, preventing and treating dental and facial irregularities. Most alignment problems become apparent once the permanent teeth begin to come through the gum (erupt). But your orthodontist may recommend waiting until enough teeth have come through before applying braces. Most children get braces between the ages of 8 and 14, while their facial bones are still growing and their teeth are easier to move. · Oral exam. Your orthodontist conducts a full exam of your teeth, jaws and mouth. · X-rays. You'll get a series of X-rays to determine the position of teeth. The most common is the panoramic X-ray, which shows all the upper and lower teeth in biting position and any teeth still developing within the jaws. Special head X-rays also may help determine the size, position and relationship of jaws to teeth. · Plaster models. You'll bite into soft material, which remains on your teeth for a few minutes. From this impression, a plaster model of your teeth (dental cast) is created and the orthodontist evaluates your bite. In some cases, this dental cast may be scanned into a digital format for further evaluation or treatment decisions. · Potential tooth extraction. If your mouth is very overcrowded, your orthodontist may recommend removing one or more permanent teeth to allow room for the remaining teeth to fit comfortably. · Other procedures. In severe cases, where tooth movement alone will not correct a bite that's significantly out of alignment, jaw surgery is required in combination with orthodontics. After your orthodontist has evaluated your teeth and jaws, he or she customizes a treatment plan for you. This most often involves the use of fixed braces, which are temporarily bonded to your teeth. Treatment consists of three phases: the initial placement of the braces (or clear aligners), periodic adjustments and wearing of a retainer after the braces are removed. · Brackets attached to the outside surfaces of the teeth. Or they can be attached to the backside of teeth, hiding them from view, but this makes them a bit harder to access. Brackets can be made of stainless steel, ceramic (clear or tooth-colored) or other materials. Modern metal brackets are smaller and less noticeable than they used to be. · Ring-like bands that encircle the molar teeth. Before bands are applied, space is created by placing very small rubber bands (spacers) between the molar teeth. Bands are made of stainless steel or titanium. A buccal tube attached to the band of the last molar holds the end of the connecting wire in place. · A flexible wire that connects all of the brackets and bands, controlling movement of the teeth. · Various accessories to help position the teeth, in addition to the fixed components. Small rubber bands (elastic ties) secure the wire to the brackets. Larger rubber bands also may be used to help move teeth. Headgear (usually worn at night) may be used to help hold or move teeth into the correct position. Instead of using fixed braces, certain people who need only minor corrections may benefit from a series of customized, removable appliances called clear aligners. Typically, each set of aligners is worn for two to three weeks, as close to 24 hours a day as possible — except when eating, brushing or flossing — until it's replaced by the next set. You should also remove the aligners when drinking liquids that might stain the aligner, such as coffee or tea. After fixed braces are placed on your teeth, your orthodontist adjusts them periodically by tightening or bending the interconnecting wires. This puts mild pressure on the teeth and gradually shifts them into new positions. The jaw responds to the pressure by dissolving bone in the path of the moving tooth and laying down new bone behind it. Occasionally, the orthodontist may use tension between the upper and lower jaws to help promote correct alignment. This is often done with elastic bands stretched between opposing teeth. Your teeth and jaws may feel slightly sore for a day or two after an adjustment. This discomfort can usually be eased with an over-the-counter pain reliever. Tell your orthodontist if the discomfort is severe or becomes worse. After dental braces are removed, the newly straightened teeth need to be stabilized for a period of time (retention period) to prevent them from shifting back to their original position. This is accomplished with the use of a custom-made appliance typically made of plastic or plastic and metal wires that help teeth stay in place (retainer). Retainers are usually removable, but may be fixed. Or a combination of fixed and removable may be used. Braces are generally very effective in realigning crooked teeth and help correct improperly positioned jaws, creating a nice smile and a healthy mouth. On average, most people wear full braces for one to three years. Retainers may be worn indefinitely to ensure that the final results remain stable. The person wearing the braces has an important role to play in the success of the treatment. Follow the orthodontist's instructions precisely, especially during the retention period. When it comes to this final phase, it's important to wear the retainer as directed or risk losing the benefits gained while wearing braces.